Manipulating sound until it seemed to be something that existed in real space. This refers to playing back existing recordings through a speaker or speakers in real-world acoustic situations, and recording that playback with microphones so that the new recording takes on the acoustic characteristics of the place it was "re-recorded." Worldizing is a sound design concept created by Walter Murch. Back in 1973, Walter Murch was working on American Graffiti and trying to create something new with the film's Wolfman Jack sound material -- commercials, hit songs, DJ rants. His task was to turn the soundtrack into a cohesive soundscape, to make every car cruising the city of Modesto, California a player in a citywide radiophonic symphony. The idea was that every teenage car in this town was turned to the same station, and, therefore, anywhere you went in the town, you heard this sound echoing off the buildings and passing by in cars. George [Lucas] and I took the master track of the two-hour radio show with Wolfman Jack as DJ and played it back on a Nagra in a real space - a suburban backyard. I was fifty-or-so-feet away with a microphone recording that sound onto another Nagra, keeping it in sync and moving the microphone kind of at random, back and forth, as George moved the speaker through 180 degrees. There were times when microphone and speaker were pointed right at each other, and there were other times when they were pointed in completely opposite directions. So that was a separate track. Then, we did that whole thing again. When I was mixing the film, I had three tracks to draw from. One of them was what you might call the "dry studio track" of the radio show, where the music was very clear and sharp and everything was in audio focus. Then there were the other two tracks which were staggered a couple of frames to each other, and on which the axis of the microphone and the speakers was never the same because we couldn't remember what we had done intentionally. Sometimes, Wolfman Jack would be on axis on one track, but he would be off axis on the other track. I was able to blend those three tracks to get the right amount of atmosphere. I could make transitions from a live, very present sound to something that sounded like it was very distant and bouncing off many buildings. I could create a sense of movement too - hence, the moving microphones. 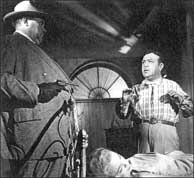 This is what I discovered Welles had done in a more primitive form in Touch of Evil. What he had not done was combine the original recording and the atmospheric recording. He simply positioned a microphone, static in an alleyway outside Universal Sound Studios, re-recording from a speaker to the microphone through the alleyway. He didn't have control over the balance of dry sound versus reflected sound, and he didn't have the sense of motion that we got from moving the speaker and moving the microphone relative to one another. This creates the sonic equivalent of depth of field in photography. We can still have the music in the background, but because it's so diffuse, you can't find edges to focus on and, therefore, the dialogue which is in the foreground and which is in focus is clearly what you're supposed to be listening to. That was the defect of all previous systems, except for Welles' system. In them the music was just filtered and played low, but it still had its edges, and, therefore, it became hard for the mind to separate out the edges of the music versus the edges of the dialogue. We came up with a way of taking music that might, at one point, be fully in the foreground - in focus and loud - and, then, during a scene transition, sent way into the background and thrown out of focus so that people could talk in the foreground in dialogue and not have you driven mad. No other film before that one had had 42 songs back to back. They would have maybe three or four, five or six at most, scattered throughout the film. Digital reverb units are stocked with enough horsepower and brilliant programming to sound terrific, but to my ear, the digital version never sounds quite like the real thing. The most convincing way to make something sound like it was recorded in a room is to record it in one - but sometimes that’s not possible. In addition, you may have several sounds recorded under different circumstances that you want to sound as though they belong together. The solution to both problems is to worldize the sounds, that is, to play them back in an appropriate space and record the playback. That means lugging around a high-quality sound-playback system along with your recording rig. Place a speaker in a room or location with the desired aural fingerprint and position a microphone some distance from the speaker. Next, play back your original sounds through the speaker and re-record them on another tape recorder, capturing the sound with all the reverberant characteristics of the space. That requires much time and effort, but when only the most authentic reproduction will do, worldizing can get you there.